There is a crime. Of that we are certain. But we are not so sure of the place and time. Follow Maura through the looking glass and down the rabbit hole as we try to piece together reality from fantasy. 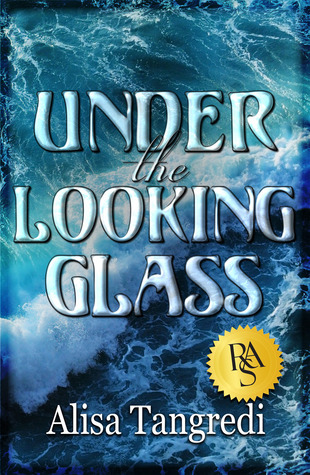 Under the Looking Glass is essentially a dramatic mystery that reveals itself slowly through the unreal imaginings or memories of Maura Reyes after a home invasion upsets her life. The condition of her husband is not fully known and the fate of her dog, unstated but seemingly dire. What follows is a particularly disjointed set of scenes that are played out between herself and several characters including her husband, her psychiatrist, a psychologist and two homicide detectives. Understanding the images was like making my way through a mirror maze with reflections of the main character staring back at me at every turn. Slightly shifting variations of the same scene were repeated, while I tried to intuit the truth behind the narrative. What happened to her husband? Where and when is she? And why is she spending so much time on a fantastical ocean liner? Has she lost her mind? The enigma of Maura Reyes, her past and present, slowly unravels under the weight of discordant images – a kind of subconscious interrogation, led by a white rabbit, on a Wonderland cruise and on the other side of looking glass under which she lies. Interestingly, as the main character finally starts climbing out of the rabbit hole, the reader is pushed in. After my own fall, as reality crept insidiously towards me, I realised that up was down and what was dark had only become darker. On my side of the glass, I could do nothing but look on helplessly as my sympathies ricocheted like deflected bullets. I felt used; but in a good way. There really isn’t much in the way of character development in this story – even for the main character herself. The story is more a cerebral exercise designed to leave us disoriented until the truth hits us like a hammer. If you really must engage with characters to enjoy a story, perhaps this will not be for you. This was not a character study, more like a character discovery. I always find disjointed and fragmented stories difficult to enjoy. It’s hard to find a thread to commit myself to and each shift is a jolt out of the story. For this novel, the fragmentation made sense once the author had fully trapped me inside her web. However, sometimes even with clever ideas, the execution can still fail on some level, and knowing how necessary the approach might have been didn’t win me over fully. The snatches of scenes along with the protagonist’s reactions to them started to become a little repetitive. There’s only so many “What the Hell is going on?” reactions I can read before it starts sounding like a mantra, repeated to induce numbness rather than full engagement. My reservations aside, I thought the little poison pill at the heart of this nightmare-scape was worth it. I enjoyed the revelation that I, not the main character, was the Alice in this twisted little fairytale. Having already been suitably impressed with The Puppet Maker’s Bones (review here), this story has done nothing to sate my appetite for this author’s work. If you don’t have a problem with a confusing kaleidoscope of scenes slowly resolving into a nasty reality, I think you’re going to love this one. This entry was posted in 4, Mystery, Novel, Reviews and tagged Drama, Fairytale, Mystery. Bookmark the permalink.